n. Now is a great time to walk around both sides of your fence with a screwdriver and tighten any screws that have become loose. With winter weather only a few weeks away, now is the time to prepare your fence for the upcoming season. Snow, ice, and high winds can cause significant damage to many types of residential fences. It is a good idea to take the time to prep your fence so that it will remain in good condition throughout the entire year. Keep reading for a tips on how to prep your fence for the winter months! Leaves fall from trees during the fall season and sometimes land atop of fences. It is important that you spend some time cleaning off any leaves, twigs, and other debris from your fence because it can cause mold to form on your fence. Also, the added weight of debris can be enough to damage the integrity of it. Over the years, it is likely that any screws on your fence will loosen. Now is a great time to walk around both sides of your fence with a screwdriver and tighten any screws that have become loose. By doing so, you are strengthening your fence and preparing it for harsh weather. While you are at it, it is a good idea to replace any broken or rusted hardware. 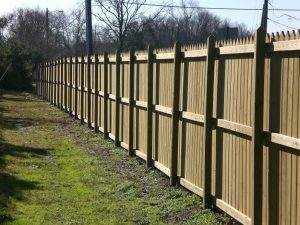 Do you have a wood fence in your yard? If so, when was the last time you applied a sealant? The more waterproof you make your fence, the longer it is going to last. There are many products today that can easily be applied to residential fences. One of the best ways to ensure the integrity of your fence is to check it for cracks. If a panel has a crack, swap it out for a new one. This entry was posted on Friday, November 30th, 2018 at 1:41 pm. Both comments and pings are currently closed.